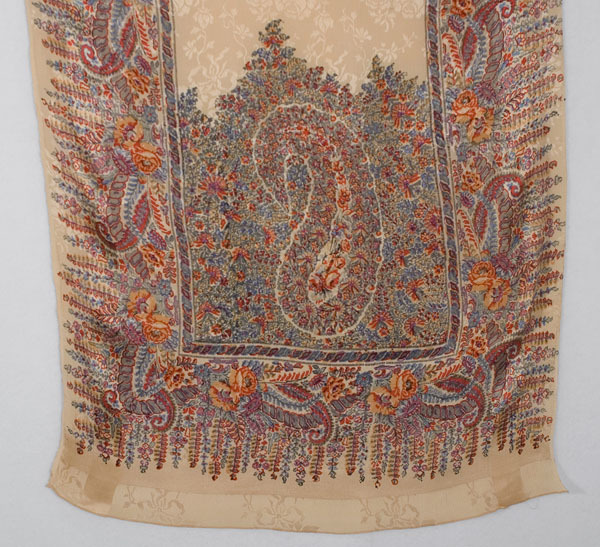 Liberty & Co. of London started out as an importer of Oriental wares, including fabrics. 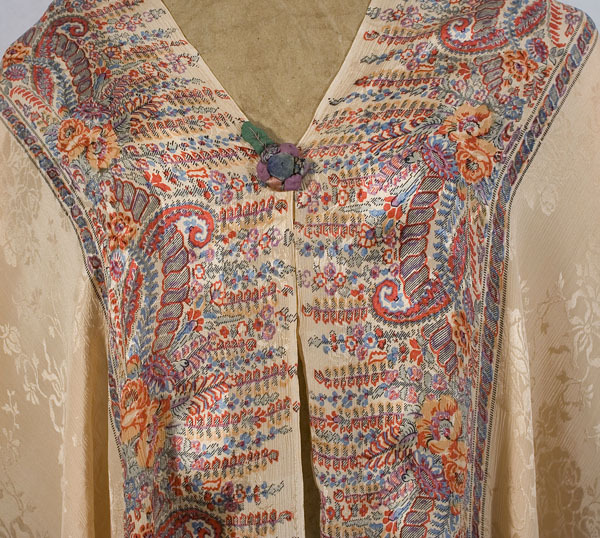 Liberty's began producing its own fabrics in 1879 and soon became famous for luxurious silks, most suited to the clinging robes and draperies worn by the artistic community (Aesthetic Dress). 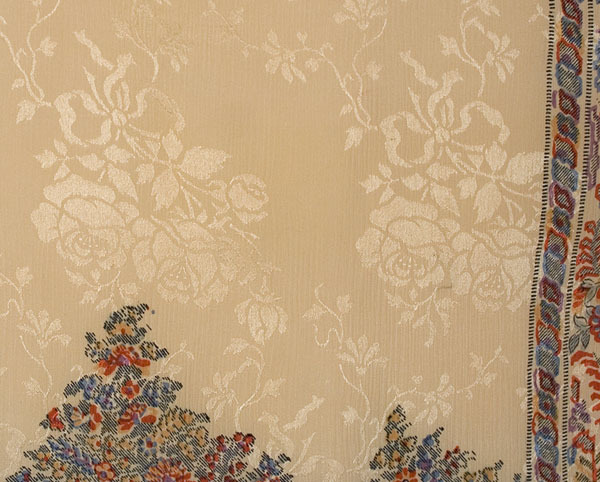 Liberty's introduced delicate pastel tints, like the delicate colors in our shawl, referring to these hues as Art Colors. Today these colors are synonymous with Art Nouveau, the movement in reaction against the academic schools of art at the end of the 19th century (1894-1914). 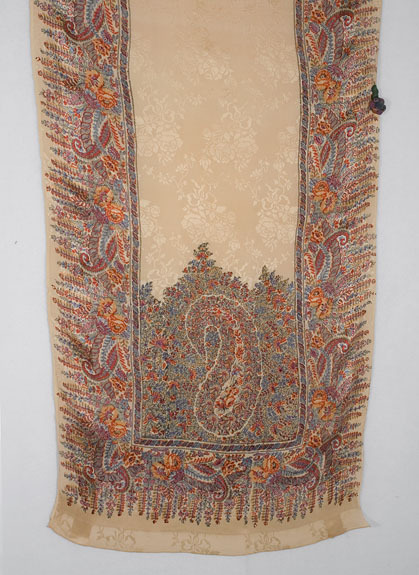 Liberty's was so closely identified with the movement that the Italian name for Art Nouveau is Stile Liberty. 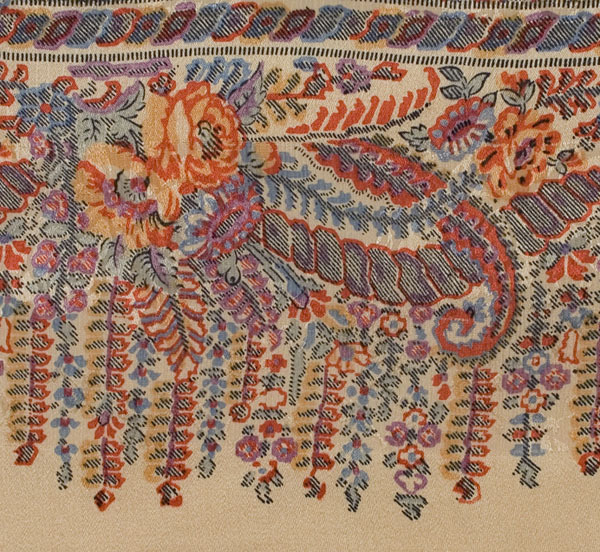 Our shawl features an exotic Persian-style pattern printed on a ground of delicate peach silk damask. 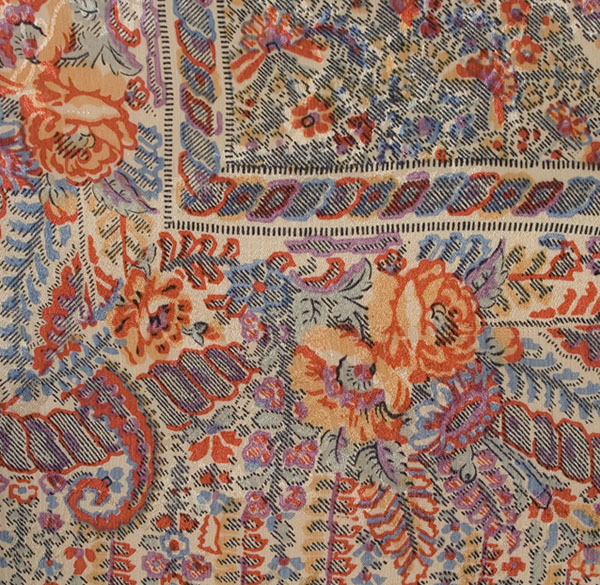 The multi-colored, paisley (boteh) motif, originally borrowed from imported Kashmir shawls in the 1790s, found an enduring place in the vocabulary of European print design. The characteristic teardrop shape evolved from stylized plant forms. The shape lends itself to myriad elaborate variations. 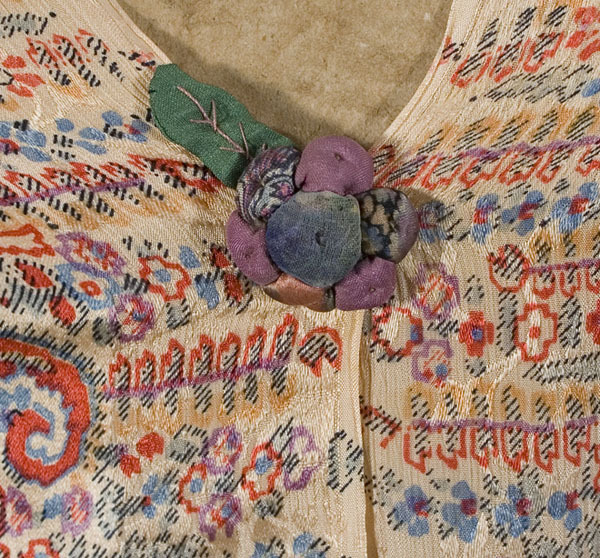 By the early 19th century, the boteh had evolved into a naturalistic style densely packed with flowers. The incredibly fine grained scale of the design has an effect similar to that of Pointillist painting (Georges Seurat, 1886). 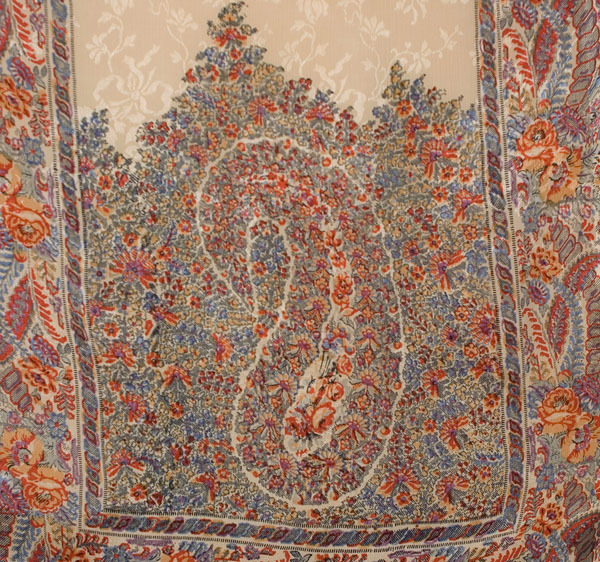 The boteh motif was first reproduced for European textile production in Paisley, Scotland. 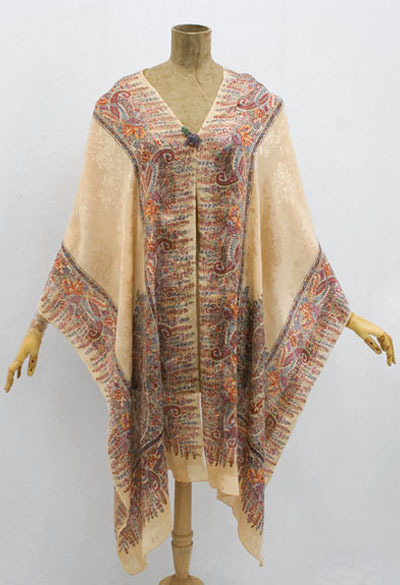 Every connoisseur of fine shawls should own at least one boteh shawl, since the motif was the historical symbol and standard of fine Kashmir shawls when first imported into Europe. 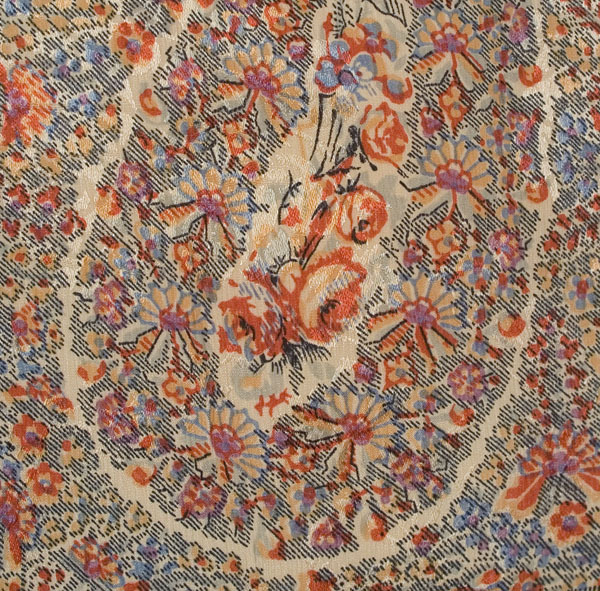 There is a padded Chinese floral closure, a detail often used in Liberty designs. 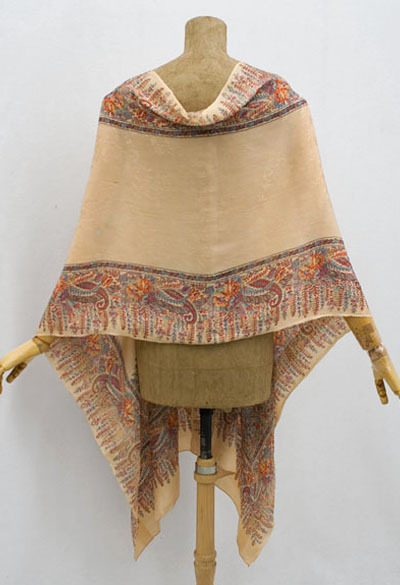 Our gossamer shawl will not keep you warm, but you will be wrapped in beauty. It measures 23" wide by 94" long.